Thom Yorke and Nigel Goodrich were in the studio the day of the shooting. “Friday was an unforgettable day here at KCRW on the campus of Santa Monica College. 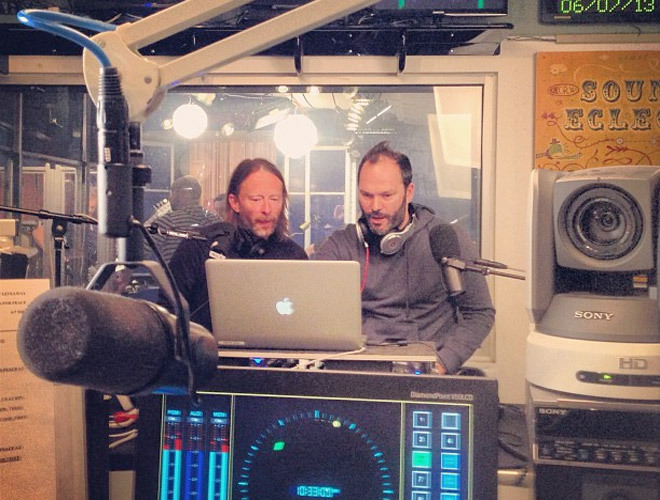 The day started with Thom Yorke and Nigel Godrich of Atoms for Peace performing a DJ set on Morning Becomes Eclectic. Then, at 11am the band Boxer Rebellion played a live set of music. Just before noon we heard the gunshots that started 13 minutes of terror and days of shock and sadness. All of our staff and visitors were far too close to the violence, and knowing that still causes me to shudder. The evacuation of the entire campus meant leaving KCRW unattended for the first time in its modern history. Due to the great work of our engineering staff, we were able to remotely operate the station. Our friends and colleagues at NPR West offered their studios and stayed late to accomodate us. Evacuated KCRW producers conducted eyewitness interviews and collected information that we were able to send to the on-air team across town. You can read about it on the Which Way LA? Blog. After two days out of the station we are now back and operating as usual. We are shaken and sad, but glad to be able to turn to the work you’ve come to expect from us. Santa Monica College lost a wonderful employee along with his beautiful daughter. The college’s foundation has established a memorial fund honoring Carlos and Marcela Franco. I want to thank the many listeners and friends of KCRW who reached out with assistance and support. We are proud to be part of such a caring and resilient community.